(Washington, D.C. 4/8/14) On Wednesday, April 2, Rev. Nilton Giese, General Secretary of the Latin American Council of Churches (CLAI), and Rev. 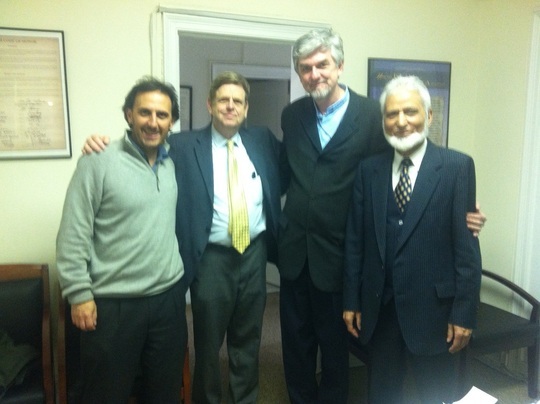 Felipe Adolf, CLAI’s President, visited ISNA’s office for Interfaith & Community Alliances (IOICA) along with Martin Shupack, the Director of Advocacy at Church World Service. The two Latin American leaders shared their views on the evolving U.S.-Latin America relationship and talked about the involvement of Muslim communities in interfaith dialogue and partnership in South American countries. They were particularly cognizant of Muslim leadership in countries like Argentina. Dr. Syeed, National Director of IOICA, emphasized how critical it is for their Christian churches to have positive relationships with their Muslim neighbors. He provided them with examples of close relationships between various Christian denominations and the Muslim community in the U.S.
During their visit, Rev. Gies and Rev. Adolf also spoke with Christina Warner, the Director of the Shoulder to Shoulder Campaign. She explained to them how Shoulder to Shoulder was formed by Christian, Jewish, and other religious organizations to campaign against anti-Muslim sentiment and how it has proven to be a success story for American religious communities.